WOW!! These Cake Batter Truffles are fantastic! The addition of cake mix to the coating is pure genius! Sometimes I am amazed at the things people come up with. I took a plate of Cake Batter Truffles to a get together and everyone that tried them LOVED them. People were raving about them! I even had one lady tell me she thought she would end up with a tummy ache from eating so many. Delicious! Beat together butter and sugar using an electric mixer until combined. Add cake mix, flour, salt, and vanilla and mix thoroughly. Add milk 1 tablespoon at a time until you get a nice workable dough consistency (I only needed 2). Mix in sprinkles. Roll dough into one inch balls and place on a parchment or wax paper lined cookie sheet. Chill balls in the refrigerator for at least 15 minutes to firm up. Slightly adapted from The Girl Who Ate Everything. 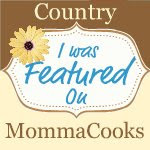 Linked on Get Your Brag On #18, Country Mamma Cooks, The Answer is Chocolate, Tatertots & Jello, Anything Goes Linky #33, Sweets for a Saturday #53, Show Your Stuff and Foodie Friday. I can just imagine putting a bowlful of those as a centerpiece at a table. I think people would love it. Green Onions - Did You Know??? Fun with the Kids - A Surprise Picnic! The Liebster Award - My First Award!